Some days you’re just not feeling it—you can tell before you get out of bed that you’re dragging, and no amount of coffee or sunshine seems to snap you out of it. But your Fitbit, or your FuelBand, or that overly peppy trainer you thought it would be a good idea to hire aren’t taking “meh” for an answer. Wouldn’t it be great to have some fit tech that responded to your overall energy level with tailored workouts? Vitness Rx is aiming to achieve just that very thing. The starter kit includes a chest-strap heart-rate monitor, a square dongle that plugs in to your iPhone’s headphone jack, an armband for your iPhone, and a promo code for the Vitness Rx app for iOS (which otherwise costs $10). But instead of simply monitoring your heart rate while you work out, the chest strap determines which workout you should do. The idea is to strap it on first thing in the morning, ideally before you’ve even gotten up—and definitely before you’ve had a cup of coffee. It determines your energy level—and the appropriate workout for that day—by examining your HRV, or heart rate variability, basically a measure of how regular your heartbeat is. The chest strap’s pulse sensors need to be slightly wet for the best performance, so you can dampen them with a little water (or even a dab of saliva if that doesn’t gross you out). You must push the dongle all the way into the headphone jack until you hear a click, and for me that meant removing my iPhone case. Once you get your Vitness Rx for the day, you can work out anytime. 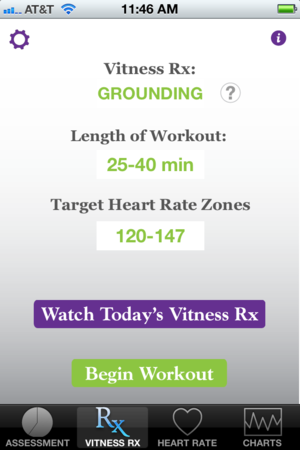 Once you’re strapped in, launch the Vitness Rx app and tap the Assessment tab. Tap the Start button, and the chest strap will start sending your pulse to the app through the dongle. Once it locks on to your pulse, you have to follow the deep-breathing prompts in the app throughout the 60-second assessment. That gives you a Vitality Score somewhere between 50 and 100, with a higher number being better—don’t mistake it for your resting pulse, where a lower number is better, of course. Tap the Save to Chart button to log the score, and you’ll advance to the Vitness Rx tab, which shows you which of the three Vitness Rx workouts you should do: Heating, Grounding, or Cooling. Each has a different workout time and target heart-rate zone, and you can tap Watch Today’s Vitness Rx to watch a video outlining the exercises. If you’re ready to work out, tap Begin Workout. You don’t have to work out first thing in the morning, though—the Vitness Rx score is good for the day, so go ahead and remove the chest strap, get out of bed, and grab that cup of coffee. When you’re ready to get sweaty, hook up the system again: Put on the chest strap and insert the dongle—and this time add the included armband, which fits every iPhone and iPod touch. Watch the video again in the Vitness Rx tab for a refresher, and then tap Begin Workout, which advances you to the Heart Rate tab. This is the screen you’ll watch as you exercise—it’s even in landscape orientation so that you can glance at it while your iPhone is in the armband. If you need a reminder about the order of the exercises, tap Rx Quickview for a scrollable list of exercise names next to still images of them. Otherwise, tap Start to begin the workout timer, the current heart-rate reading, and the calories-burned calculation. As you exercise, you’ll hear audible cues to help your heart rate stay in the target range. The videos show you what to do, but you see them only before you start working out. Let’s stop here before delving into details on the mostly great workouts themselves, because we’ve just uncovered the Vitness Rx’s main weakness: Although the app has shown you a 3- to 5-minute video outlining the exercises in your workout, it's up to you to remember how to do those exercises and to time or count them yourself. For example, the Heating workout (which is the most intense, for days when you are rested and refreshed with a high vitality score) has five exercises that you’re meant to do for 1 minute each, after which you must cycle through all five moves again two more times. But the video is merely an introduction to those exercises, and the Rx Quickview is just images. So I have to make myself a little cheat sheet to tape to the floor, and time the minutes by watching the overall workout timer. It would be much easier to have an included audio track to follow along to. The Heart Rate screen is in landscape so that you can keep an eye on it during your workout, and so that you can tap the Rx Quickview button on the bottom for a pop-up showing still images of the exercises. Additionally, because the dongle plugs in to the iPhone’s headphone jack, no audio will play through the iPhone’s built-in speaker. The only way to hear the heart-rate cues is to plug a pair of headphones into the dongle, which means your iPhone needs to be strapped to your arm. If the chest strap used Bluetooth instead (as this one from Scosche does), the iPhone would need to be in range, but you could use the speaker instead of headphones. Still, the workouts themselves are pretty great. The concept of tailoring a workout to your energy level really works, and Vitness Rx adds new workouts periodically, so you won’t get tired of doing the same three over and over. The workouts are fun and don't require any special gear. On days when your energy is high (according to your Vitality Score, anyway), you’ll do the Heating workout. It’s only about 15 minutes long but very intense, aiming to keep your heart rate at about 80 percent of its maximum. You can do all the exercises—cross-country skier, pushup jack, single-leg hop cross, and low mountain climber—without any extra equipment, which is nice. On days when your Vitality Score is low, you’ll get the Cooling workout—the app says these are for when your system is “overheated and overwhelmed,” and your body needs rest. It’s a longer workout, between 30 and 60 minutes, but at a lower intensity, the goal being 65 percent of your max heart rate and lower. The routine the app gave me was six yoga poses to hold for about a minute each; it instructed me to go through the cycle four times or more. Again, no equipment is needed, and the poses weren’t difficult, even though I’ve dabbled in yoga only once or twice before. The first pose, however, was the sun salutation, which is really a series of poses, so it was a little tricky to remember. Luckily, the Cooling workout video showed the entire yoga routine, so I was able to just play it all the way through, listen to the instructions, glance at my arm when necessary, and then restart it again at the end of each sequence. On days when your energy is “middle of the road,” you'll do a Grounding workout, aiming for 65 to 80 percent of your maximum heart rate for between 25 and 50 minutes. The exercises for this set are calisthenic-like moves such as lunge toe touches, straight-leg crunches, and plank pose with single leg lifts. In total I received a set of five exercises (10 to 20 reps each) to repeat three times. But the 3-minute video felt rushed—I had to make a cheat sheet to keep up, but at least I could count reps myself. 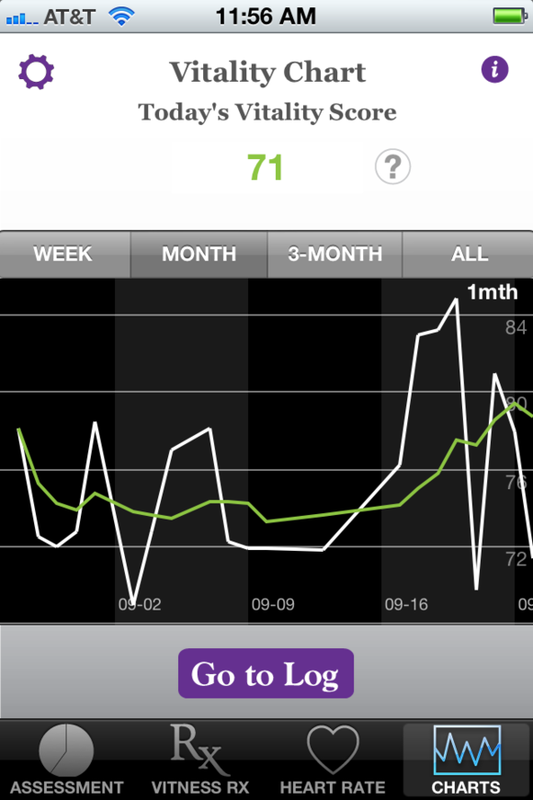 The white line shows all your Vitality Scores, and the green line averages them out over time. When you’re done with your workout, tap Save on the Heart Rate tab to save your exercise data to the log. Along with the Vitality Score and Heating/Cooling/Grounding Rx (which you can get without working out at all), the app saves the length of time you worked out and how many calories you burned—calculated from your weight and gender entries in the Settings screen. 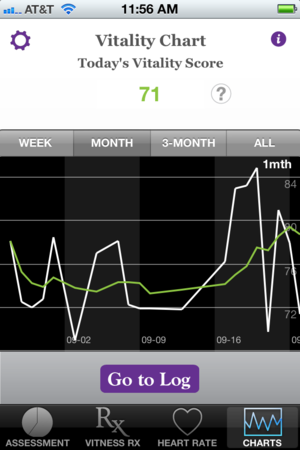 The Vitality Score displays on a chart, with a green line that shows your average over time and a white line that shows exact points. You can tap Go to Log to see all the data and optionally email it to someone in CSV format. For an exercise system, however, Vitness Rx collects very little data. I can’t enter my own notes about how I felt that day, and the heart-rate data isn’t represented at all. The system makes no attempt to track weight loss, or even to include a little motivational calendar that shows how many days I’ve worked out this month. Vitness Rx is a solid system. The workouts take less time than it would take me to drive to the gym and suit up, and even though I generally hate exercising, I found them fun to do. But the app could use more features to help me stay motivated between workouts and remember what I’m doing during them. The user manual suggests alternate workouts—swimming or cycling on Grounding days, walking or “mellow yoga” for Cooling, and interval training or sprinting for Heating, for example—but those aren't mentioned in the app. It’s iOS-only too, no Android version. And it isn’t optimized for the taller screens on the iPhone 5 and fifth-gen iPod touch. Still, what’s on offer here is generally pretty great. If you’re looking for effective workouts that don’t require special equipment (or even shoes), and a program that respects the fact that you’re not at your best every single day, Vitness Rx is worth a look. Vitness Rx is easy to use and its no-equipment workouts will make you break a sweat, but its iOS app could use a little more polish. Varies workouts according to your energy level. A Bluetooth chest strap would be more convenient. App could do more to help you execute the exercise routines and stay motivated.